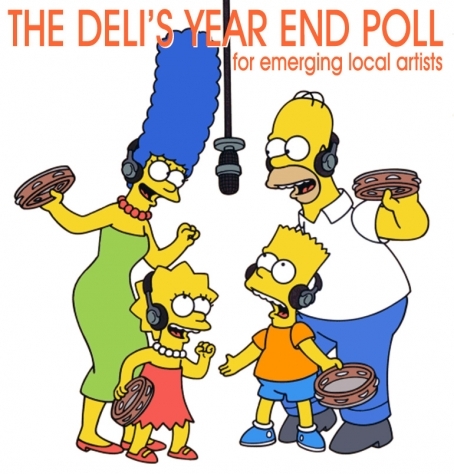 Thanks to all the artists who submitted their music to be considered for The Deli's 2015 Year End Poll for emerging local artists! Jurors: QD (The Deli Philadelphia), Jordannah (The Deli San Francisco), Paolo De Gregorio (The Deli NYC). “I don’t want it if it’s just for fun,” sings Toughies vocalist Carl Smith. The lyric echoes throughout “What Are Hands For?”, the second track off the band’s debut EP. Ironically, Tough Enough is a great deal of fun, complete with indie pop chords, full-chorus sing-alongs, and an adorable fluffy cat featured on the back of the album art. Yet this lyric perhaps encapsulates the tone of the EP’s 6 tracks—though the music is catchy and bright, it’s not ‘just for fun.’ In fact, the band has produced something of meaningful substance. The Lawrence-based quartet released Tough Enough in September of this year. In addition to vocalist Smith, the band consists of Brad Girard on guitar, Joe Gronniger on bass, and Caroline Lohrenz on drums. 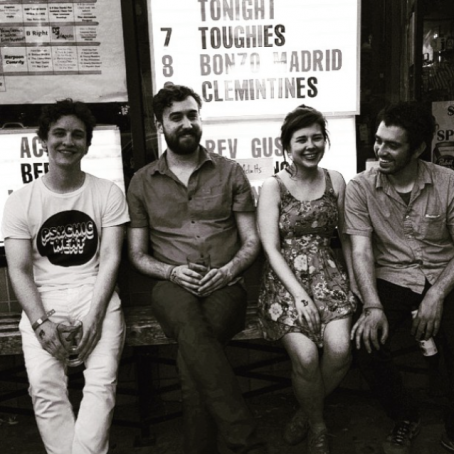 The EP’s opening track, “Sloane,” immediately introduces us to Toughies as a unified team. Listening to the strong vocals sung in unison supplemented with the image of a wandering cowboy on the cover of the album, one can’t help but imagine singing this song while sitting with friends around a campfire. Tough Enough explores that in-between space traveled by so many trying to navigate young adulthood: the sadness of a break-up, followed by self-reflection, leading to sweetly sincere attempts to mend the heartache by winning that someone back. On “Birthday Party,” Smith sings from the perspective of a man who hopes an ex will show up to his party and witness how much he has matured over the past year of separation. It’s sentimental, comedic, and honest all at once. However, the somewhat tender nature of many of the lyrics by no means makes the music of Tough Enough cheesy or dull—this is indie-pop, after all. “Horsefeather” provides a dose of funk halfway through the EP that shows off the instrumental strength of each member of the band, and “Cheek” is a favorite that closes the EP on a high note. Listen closely to the last few seconds after the music stops and you can hear one of the Toughies mumble “we can go” amidst giggles, half-jokingly implying the recording was so flawless there’s nothing left for the band to do to raise the bar. Tough Enough is a skillfully constructed and warm introduction to a band we’ll hopefully hear much more of. Mary is a lifelong Bostonian learning her way around Kansas City. She can often be found in an art museum, checking out local music, or taking a nap. You only have one more chance to catch Toughies before the end of the year—this Friday at Replay Lounge. They will be appearing with Oil Boom and Monster. Facebook event page.